Mowing pavers are a great way to define your garden bed areas, property lines or tree beds. 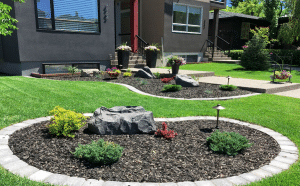 Mowing pavers are becoming more and more popular in Calgary yards. Mowing pavers are stone bricks that create a border between one area of your landscaping and another. Most often, you will see mowing pavers define a border between a garden and a lawn. They also work well as tree wells, dividing neighbouring front yards or beside driveways. Mowing pavers sit flush or level with the ground and don’t sit above ground like stack stone or wood retaining walls. They allow you to rest the wheel of your lawn mower on them so you can easily cut the grass without having your mower fall into garden areas where there is no grass to be cut. Mowing pavers really come in handy around garden beds as they prevent the mower wheel from falling into the garden bed. This common problem often causes you to scalp the lawn surrounding your garden and you may end up mowing decorative rock or mulch unintentionally. We install our mowing pavers with polymer sand in between each stone so you don’t have to worry about grass or weeds coming up between each paver. We also excavate the soil and installed tamped gravel along with sand. This type of compacted granular base gives you a longer lasting mowing paving border that is more resistant to frost heaves. Click on estimates to request a free consultation.